: Use the direction pad to control the flight path of Otocky. He can maneuver in eight different directions. When A is held down to shoot, use the direction pad to determine in which direction to fire a bubble. Note that Otocky cannot move while the A button is held down. : Hold down the A button to put Otocky in offense mode. When pressing the A button, you must press a direction in order for the bubble beam to fire. Pressing A alone will do nothing. : After you have collected at least one B bubble per stage, you can press the B button to use your special weapon. This special weapon can only be used to attack enemies, not to capture note bubbles. After you run out of ammunition, you cannot use the B button to attack until you collect another B bubble. : Press Start to select the save file you wish to operate, and press it mid-game to pause the action. : Only used in B.G.M. Mode and Music Maker mode to change selections along the bottom of the screen. When starting a new game, you must enter a new name in one of the three save files, typical of many Famicom Disk System games. You can register a new name, or delete an existing file. After registering a new name, you can begin to play using the file that you select. Upon selecting a file, you will see the menu screen shown to the right. When you first play the game, only Game Mode will be available. You must first play and completely beat the game to make the other two modes available. Once you beat the game, a crown will appear next to your name on the save file screen, as shown to the left. Game Mode is the main mode of the game, and the focus of the walkthrough. B.G.M Mode is a mode of the game where you cannot get hurt, nor can you complete the stage. The only point of B.G.M Mode is to play through the stage while listening to the music and focusing on complimenting the tune by firing in 8 different directions. Music Maker is a mode which allows you to compose you own back ground music for all 11 stages, and then gives you the ability to play through the stage while listening to your own compilation. See the Music Maker Mode page for more information. You must pilot Otocky through 11 musical stages. Each stage automatically scrolls from right to left, and you have the ability to fly through any available portion of the screen. To fire your bubble beam, you must press and hold the A button while pressing a direction to indicate where you would like to fire. Otocky can fire up to two bubbles on the screen at one time, but the bubbles will only be fired on the up or down beat with the music. The back ground music plays at approximately 120 beats per minute, which means there are four eight note beats per second that you can fire a bubble on. Every bubble will travel a certain distance, unless they hit something first, and return to Otocky. The length and speed at which Otocky's bubbles will travel is determined by the current instrument that Otocky is mimicking. 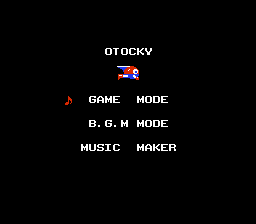 Otocky starts each stage with the Organ sound which, while not the worst available, does not travel far and is not particularly fast. Otocky can use the bubble weapon for three things; collecting notes, breaking note blocks and attacking enemies. When freeing a note from a note block, Otocky must fire off a second bubble to collect the notes. 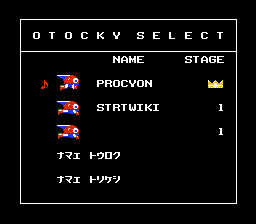 Otocky must collect enough notes from every stage to engage the stage boss in battle. Whenever Otocky is struck by an enemy, you will lose a small portion of the note meter, and Otocky's bubble weapon will shrink. Although the shrinking bubble does not impact your ability to fight dramatically, it does indicate the amount of remaining health that Otocky has left, and the amount of damage he can withstand before he dies. When the bubble reaches it's smallest size, Otocky will be killed by the next collision. Otocky has one other weapon to use again the enemies. If you collect one of the B bubbles, you will be assigned a random special weapon, which has 8 uses before it runs out. The weapon will follow a particular pattern of attack according to which variety to obtain when you collect the B bubble. These weapons cannot be used against the boss, but they can be used against the enemies spawned by the boss. Throughout the game, Otocky can collect various bubbles to help you progress through the game. Only the note bubbles can be collected by Otocky's bubble weapon. All other bubbles can only be collected by flying into them. Single Note: This is the most common bubble you will find throughout the game. They provide you with the smallest increase to the note meter at the bottom of the screen which you must fill in order to escape the stage and challenge the boss the a battle. They will make up a majority of the bubbles you collect to complete a stage. Double Note: Much less common than the single note variety of bubble, you will still encounter quite a few of these throughout the game; more so in the earlier stages. Naturally, they fill up your note meter twice as much as a single note bubble. Triple Note: The triple note bubble is the rarest note bubble of all. Typically, they must be discovered by shooting a bubble beam at a note block. Once they appear, shoot fast as they will not remain on the screen for very long. For capturing one of these bubbles, it will fill up your note meter three times as much as a single note bubble. A Bubble: Whenever you collect an A Bubble, the instrument that Otocky mimics will change. In a majority of cases, it will change to something much better than the initial Organ that you start each level with, allowing the bubble to travel farther, or faster, or sometimes both. Occasionally, you may get a worse instrument, so if you have a good one, try to stick with it instead of taking a chance with A. B Bubble: For every B Bubble that you collect, you will receive 8 shots of a randomly assigned special weapon. The type of weapon you obtain is shown as a symbol next to the ammunition meter which indicates the type of path that the special weapon bullets will take. Special weapons are only useful against basic enemy types. Record Bubble: After you collect the Record Bubble, you won't notice its effect right away. As you continue to fire bubbles, the direction of the next 16 bubbles that you fire will be remembered. After 16 bubbles, the game will automatically begin to play back those 16 "notes" two times, for a total of 32 bubbles. The bubbles fired by the recording count against your two bubble screen limit, so use it carefully. Stop Bubble: A Stop Bubble will very predictably stop time momentarily. All enemies and other bubbles will freeze in place, while you are given a few seconds to fly around and deal with them as you wish until the scrolling and the background music resumes. Fast Bubble: By collecting a Fast Bubble, you will increase the tempo of the background music considerably. With sped up music, you can fire off your bubble weapon at a faster rate. However, you can still only fire off two bubbles at a time, so be careful about how frequently you fire while the music is playing faster. Slow Bubble: Just as a Fast Bubble speeds up the music, the Slow Bubble slows the music down. This, in effect, prevents you from firing off bubble as quickly as you could ordinarily. Once this effect takes place, all you can do is wait for it to wear off. This page was last edited on 12 June 2009, at 12:49.